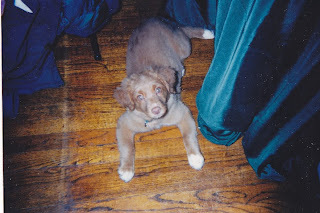 I have been intrigued by Tollers since I first read about them in an April 1992 Dog World article. One of the photos in the article pictured a Toller stretched up against the trunk of a cherry tree in blossom, looking as if it had every intent of leaping up into the boughs. I had no idea at the time this turned out to be not so very far from the truth. When we picked up our first Toller puppy in 1995 we watched her dam climb up into a fir tree to retrieve a bumper she had been thrown. The timeline from initial interest to acquisition spanned three years. After purchasing a house with a large backyard in 1994 we decided we were ready to add a second dog to our household. By that time I was doing obedience and agility with our Lab Zephyr and was particularly interested in adding a dog who would enjoy training and competing in those sports. I considered Golden Retrievers, Border Collies, Australian Shepherds and even Flat Coat Retrievers, but my mind kept returning to the article I had read about those little red dogs. 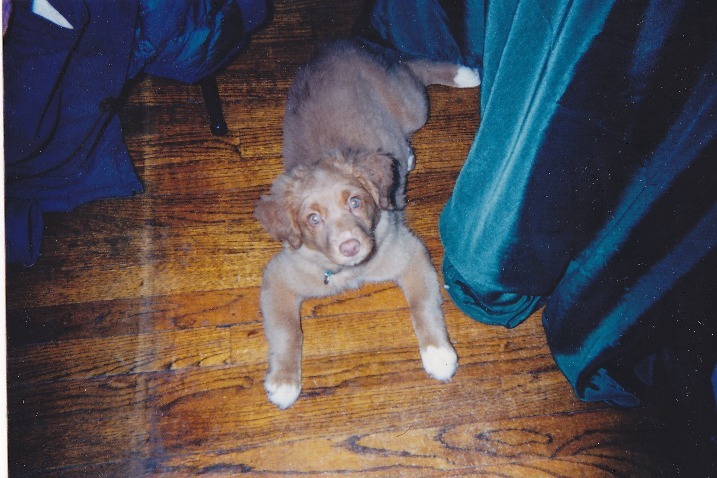 It was not easy to find a Toller in those days. I remember writing to the NSDTRC USA secretary, then Gretchen Botner, to ask for information about the breed. With her assistance I found a breeder in Wisconsin, Patty Beran. Patty helped arrange a visit with a dog she had bred who lived within 30 minutes of us. Following this, I trekked up to the Berans to meet more Tollers, and at that point, if not at some point prior, decided they were the breed for me. To me, Tollers represented a remarkable melding of the most interesting characteristics in both retrievers and herding dogs. They are clever, quick and personable, and captured my heart as no other breed has done. Patty did not have any litters coming up in the near future so she referred me to Evelyn Williams of Lonetree Kennel. I remember really trying to sell myself to Evelyn as a great potential owner, not realizing at the time how my existing involvement in various dog sports with my Lab qualified me as a desirable “working” home. There are a couple of things I clearly remember telling Evelyn. One was that I wanted a female because I thought they were smarter. I still think that’s true, though I also think it’s true that females are often more challenging and independent than males. Second, in trying to describe what I was looking for temperament-wise, I told her “I want a dog that might think it’s a good idea to jump up on the dining room table, but one that you could train not to”. For me, that simple statement continues to epitomize what I find most engaging in this breed, and is a large part of what I strive to produce in my own very limited breeding program. From the get-go, Gem was not exactly what I had expected. Sure she was smart, and cute in a geeky kind of way. And she was oh so very agile, especially when compared to our Lab as a puppy. Gem could leap on the couch in one motion like a cat, and in her younger days would often lay on the arm of our couch or loveseat. 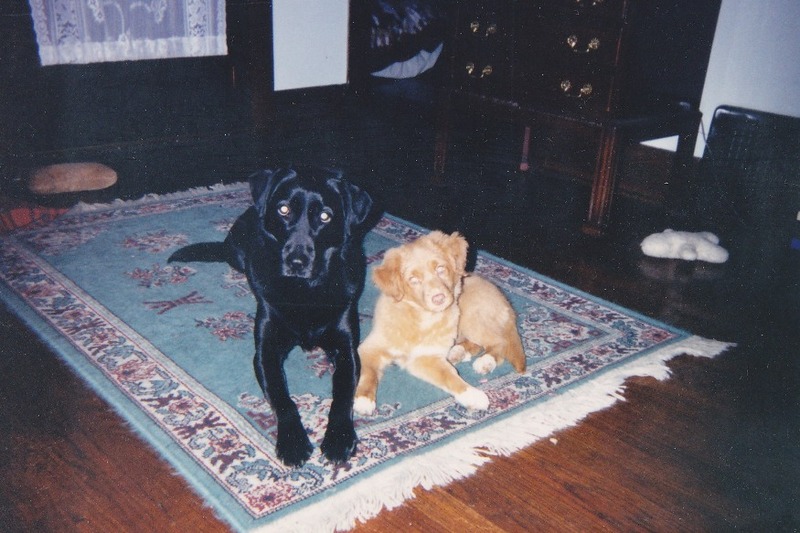 But she was also amazingly standoffish for a puppy, a very serious soul from the beginning. An invitation to jump up on the bed was obliged, grudgingly, to pacify us, though she would then jump off again at the earliest opportunity. I remember thinking at one point if I hadn’t wanted a Toller so badly I might have sent her back to the breeder. And yes I’m anthropomorphizing, but I swear it seemed she was often thinking (in a very uncomplimentary manner), what did I do to deserve ending up here? Happily, somewhere in the 3-5 year mark Gem seemed to decide she was stuck with us and decided she would make the best of it. She has managed to gradually lighten up in her later years. Still, it’s no accident her main nickname has always been “the curmudgeon”.